I have contacted the London Dolls House Company mentioned in the previous post to see if they are the company that produced this house. There's some slight confusion on my part because I think a company by the same "London Dolls House" company name folded a few years ago, so I'm not sure if it then re-emerged or if it's a completely different operation. As soon as I hear back from the company about the house, I'll post if the High-Tech dollhouse is available and what the cost is. Anyway, I think it looks stunning. Doesn't the Lake View House sort of remind you of it? A tiny bit. I received a response from the London Dolls House Company. Apparently, the High-Tech dollhouse (based on hauf haus designs in Germany) was produced by their shop in Covent Garden, which closed a few years ago. The house was made for a competition but never went into production and the one constructed was sold off within the shop. 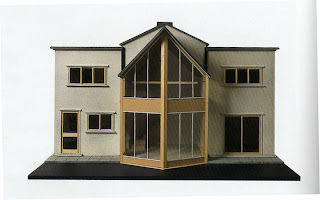 The London Dolls House Company will construct something similar for anyone interested. Contact Anne Cains at enquiries@londondollshouse.com to order one. Ohh! Please post as soon as you find out. I want one!!! Just thought I'd add some info about the High-Tech house. It was known at the time as the Millenium House as it was built around 1998 (thinking of the 2000 Millenium) I built the fitted kitchen, Japanese style sliding door wardrobes, and the fitted storage unit under the stairs. There was also a huge outdoor swimming pool surround by decking and a Japanese style garden. A gorgeous specially commissioned figure in a bikini lay back on the diving board over the pool, and I built a teak sun lounger for her. 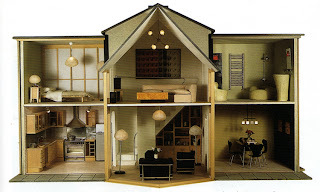 The whole house was originally photographed by Nick Forder for International Dollshouse News (July/Aug 1998 issue).